Last year, the SSI Group carried out a study on the Kwido Mementia platform for 6 months, obtaining very positive results and demonstrating that the platform could be very useful for combating cognitive impairment, both professionally and for more personal and domestic use. 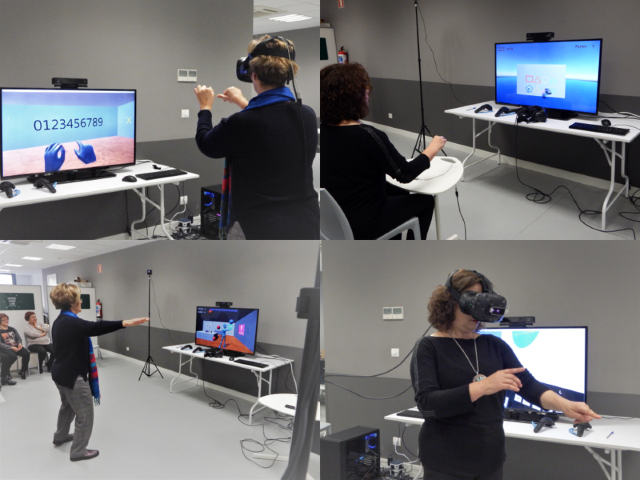 Not satisfied with these results, on Thursday 22 March, Ideable decided to work with the SSI Group once again, presenting its technological advances in virtual reality for the stimulation of cognitive skills to a group of elderly people in his Living Lab. Three different types of activities were tested, all based on games, including an immersive virtual reality exercise with glasses, HTC VIVE, a game for Microsoft Kinect and another with leap motion. All these games have been created by Ideable in collaboration with Tecnalia and the SSI Group, with the aim of making progress in the field of cognitive stimulation to reduce the degree of dependency of the elderly and detect possible cases of deterioration at an early stage, covering their social needs and thus offering them a better quality of life. Another purpose of this demonstration was to learn about their impressions of new technologies that are rarely used today for cognitive stimulation and to examine their reactions to these games, as well as to assess the results in terms of usability and how the elderly receive the use of such new technologies, which they were unaware of until now. There were some extraordinary results, as confirmed by some of the testimonies included in the video accompanying this news item. It was found to be extremely motivating and in some cases there was no technological gap to prevent them from enjoying the games and carrying out the proposed activities. Given these results, Kwido will continue to work on the use of virtual reality for cognitive stimulation, in order to continue to offer the best solutions on the market to the elderly. Next we show you the video that we recorded during the meeting.